Hi, The current temperature at our swim centre is about 31.5deg. There is talk about it increasing to about 33 as it also caters to hydrotherapy patients. My question is, with all of our squad swimmers (including my daughter) training for 1.5 hours at a time, and already complaining about the heat, are there any health issues we should be aware of should the temp go up to 33? And is it already an issue with the temp at 31.5? My experience is that most swimmers feel uncomfortable swimming in water of a temperature above 30 degrees. While many squads practice in pool temperatures up to 31.5 degrees Celsius there would not be many swimmers asked to practice in water warmer than this. For younger swimmers who have not fully developed the ability to sweat, swimming in warm water for a period of time will cause the body to overheat and give them the feeling of nausea or headaches. This can be dangerous for them. 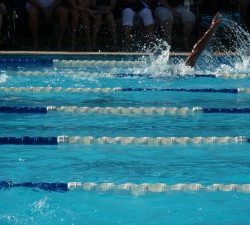 Prolonged swimming in hot water for swimmers of any age can lead to dangerous dehydration and overheating even for the very fit swimmers. My opinion is that practicing in a pool of 33 degrees C could be very dangerous for some swimmers. 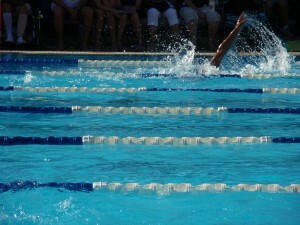 Many swimmers may also struggle with water temperatures above 30 degrees. One Response to Swimming Pool Too Hot? I can’t imagine swimming in these temperatures. I find 19 degC comfortable for ocean training, 22 – 23 degC ideal. At 28 degC I wouldn’t even consider training seriously. 33 degC is out of the question as far as I’m concerned – it’s a bath, not a training environment.